Power Tools & Air Tools. Voltage : 110 - 115V / 50Hz. H72 x W300mm at 0 x 90 Degrees. H72 x W200mm at 45 x 90 Degrees. H40 x W300mm at 0 x 45 Degrees. H40 x W200mm at 45 x 45 Degrees. With 2M PVC Power Cord and UK Plug. Blade : 254mm x 25.4mm x 3.0mm / 40Tooth. Please Check Out Our Other Items. We are a family run business based in Staffordshire. We offer a wide range of products from tools to quad bikes at affordable prices. Sign up to our newsletter for special deals. The item "HEAVY DUTY 110V 1800W 10 254MM SLIDING LASER COMPOUND MITRE CUTTING TABLE SAW" is in sale since Friday, September 29, 2017. 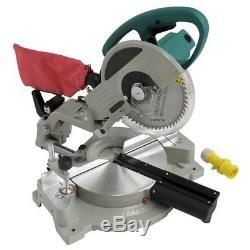 This item is in the category "Home, Furniture & DIY\DIY Tools & Workshop Equipment\Power Tools\Saws & Accessories\Mitre & Chop Saws". The seller is "one-stop-shopping-uk" and is located in cheddleton, Staffordshire. This item can be shipped to United Kingdom.